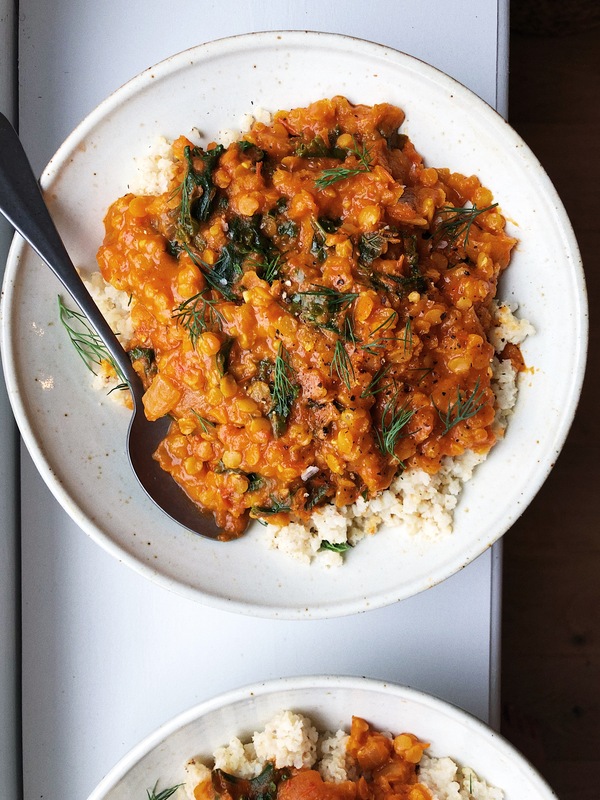 My Roasted Tomato Lentil Curry is the perfect transitional recipe from summer to fall. It takes advantages of summer’s ripe tomatoes and is a comforting dish for the cooler crisp weather. I always love using produce from the farmer’s market to create my meals. Food is special when you know it’s made with local ingredients and you purchase it from the source. However, this recipe would also be amazing in the winter and I plan to make it with plum tomatoes from the supermarket when I have to. I’m less than three months away from my due date and I plan to have a bunch of prepared meals in the freezer at my disposal. I know I’m going to have my hands full and I want to make sure I have healthy, nourishing, and delicious food on hand. This will definitely be one of my postpartum recipes. I plan to share more with you as I prepare more recipes. Preheat the oven to 400°F. Grease or line a baking sheet with parchment paper. Place the tomatoes cut side up and drizzle with 1 tbsp olive oil and a few pinches of sea salt. Roast for 40 minutes. Place tomatoes into a blender, and puree while keeping some texture. In a large heavy pot, heat 1 tbsp of olive oil over medium-high heat. Add the onions and cook until golden, about 5-7 minutes. Add the garlic, curry powder, coriander, and chilli flakes and cook for a minute longer. Add the lentils and cook for another minute. Remove pot from heat, and in this order add 1 tsp salt, coconut milk, 1 cup of water, and pureed tomatoes, to avoid splatter. Return to heat and bring to a simmer and cook for 10 minutes, stirring often. Add the kale and cook for another 10 minutes, or until lentils are softened (add a little more water if curry is becoming too dry). Season with salt and pepper. Serve hot with grain of your choice and chopped dill. This entry was posted in Main Dishes and tagged Autumn, coconut milk, comfort food, curry, fall, healthy recipes, lentils, nourishing, plant-based, postnatal, spices, summer, Vegan, whole foods. Bookmark the permalink.